SWLing Post readers might recall that, last year, I had the distinctly great honor of presenting at the 2017 Radio Preservation Task Force meeting at the Library of Congress. Several readers have asked me to share my experiences at the conference, so I’ll note the conference highlights here. I attended all three days of the conference. The first day (Thursday, November 2) was held at the Woodrow Wilson Center and focused on Cold War broadcasting. It goes almost without saying that this was absolutely fascinating. I learned a great deal. One of the day’s recurrent discussion themes, for example, focused on the keen awareness of those inside the Iron Curtain that they had been regularly subjected to propaganda. In other words, the Cold War somehow created very discerning news listeners savvy enough to separate fact from fiction quite skillfully––an ability that many fear may (unfortunately) be eroding among today’s media audiences. That afternoon, SWLing Post reader, Phil Ewing, took me on an amazing tour of NPR’s new headquarters [thanks SO much, Phil!]. 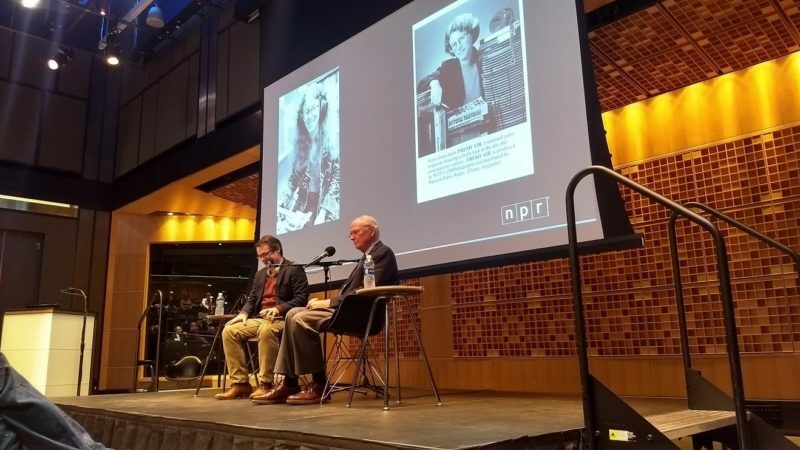 Later that afternoon at NPR, I attended an event celebrating NPR’s founding father and mission creator, Bill Siemering. Bill and I co-presented at the Winter SWL Fest in 2011, and I admire him greatly both as a journalist and as an individual; I particularly enjoyed the opportunity to be at this event held in his honor. Friday and Saturday sessions were held at the Library of Congress and were equally riveting as they covered nearly every aspect of radio preservation. Here’s our panel just a minute before the forum began. I was on the Digital Curation panel along with Charles Hardy (West Chester University and National Council on Public History), Jonathan Hiam (New York Public Library), Matt Karush (George Mason University and Hearing the Americas), Elena Razlogova (Concordia University) and Mark Williams (Dartmouth College and Media Ecology Project). The discussion was dynamic, and to my pleasure, our Radio Spectrum Archive was quite the hit. The sincere interest in this project was beyond encouraging. Indeed, after my presentation, I wasn’t able to address all of the questions from those in the audience because there were so many in line to speak to me about it; eventually the LOC had to re-arrange the room for a televised event, the 50th anniversary of the Public Broadcasting Act. But there’s more. And it’s a great ending to our story, which is really only a beginning: via Alex Stinson with the Wikimedia Foundation, I was introduced to the Internet Archive team last month, whom, to our profound delight, has wholeheartedly agreed to support the Radio Spectrum Archive by giving us nearly unlimited space to store our massive collection of spectrum files. In a word? This conference was brilliant. There simply couldn’t have been a better outcome for the Radio Spectrum Archive and I enjoyed every minute of it. Many thanks to the entire RPTF team, especially Director, Josh Shepperd, for putting this spectacular event together. I’ve been invited to a couple other archive conferences as a result of the RPTF meeting, and I’ll give these some consideration. Regardless, I know this: I’ll make room in my schedule for the next RPTF conference. No way am I missing it! And at the next conference I look forward to speaking to each one of those people with whom tight scheduling prevented my speaking at this one. After all, it’s this kind of enthusiasm that assures the Radio Spectrum Archive’s future. If you’d like a more in-depth report of the RPTF conference, check out this article in Radio World (via Richard Langley). If you’d like to learn more about the Radio Preservation Task Force, check out their website by clicking here. Many thanks to my buddy, Bennett Kobb, who also gave me a tour of the brilliant LPFM station, WERA (96.7) in Arlington, VA–what an incredibly dynamic station and staff! Ulysses E. Campbell (left) and Bennet Kobb (right) in the studios of WERA. I’d also like to thank my friend Kim Elliott for generously hosting me during the multi-day event. Even modest accommodation in the DC area is very expensive–no doubt, Kim’s hospitality made the conference a reality for me. Thanks again, Kim! This entry was posted in News, Radio History, Recordings and tagged Archive.org, Benn Kobb, Cold War Radio, Kim Andrew Elliott, Kim Elliott, Library of Congress, NPR, Radio Preservation Task Force, Radio Spectrum Archive, The Shortwave Radio Audio Archive, WERA on January 28, 2018 by Thomas. This week, I’m looking forward to participating in the three day Radio Preservation Task Force meeting in Washington, DC. The Radio Preservation Task Force (RPTF), a project of the National Recording Preservation Board of the Library of Congress, will be held on November 2nd, 3rd, and 4th, 2017 at the Library of Congress, Woodrow Wilson International Center for Scholars, and the University of Maryland. I’ve been invited to serve on the RPTF Material & Digital Curation panel where I’ll have an opportunity to talk about our work with the Shortwave Radio Audio Archive and a new project I’ve been working on: the Radio Spectrum Archive. For several years, I’ve been championing the concept of archiving radio spectrum recordings. As many of you know, through the use of software defined radios (SDRs), we can record not just one individual broadcast from one radio station at a time, but we can record an entire broadcast band, all at once. Each recording can easily contain dozens of stations broadcasting simultaneously. Later, via an SDR app, recordings can be tuned and listened to as if they were live. We believe spectrum recordings will be valuable material for the future historian, anthropologist, enthusiast, etc. Screen shot of the RSA homepage. I’ve published a new website for the Radio Spectrum Archive and I encourage you to check it out as it outlines our mission, goals and challenges. I also include a video demonstration using a spectrum recording from 1986 (originally recorded on a HiFi VCR!). Note that the website is a work in progress, there are still sections to add including bios of our spectrum archive team. Click here to check out the Radio Spectrum Archive website. Though I didn’t mention this in my Patreon campaign post earlier this week, the Radio Spectrum Archive is yet another important radio project you are supporting with your pledge. This week, for example, extra funds help me with travel expenses associated with the RPTF conference (many thanks to a kind friend who is hosting me at his home for four nights, saving me several hundred dollars!). If you have the means and would like to support the SWLing Post, the Shortwave Radio Index, the Shortwave Radio Audio Archive, and the Radio Spectrum Archive please use the link/button below to become a Patron. If you’d like more details or support options, check out this recent post. And to all of you who have supported us through Patreon and with one time gifts: thank you, thank you, thank you! If you’re not in a position to become a patron or coffee fund supporter, no worries! Just enjoy our radio sites and resources! One more note: Due to travels and a heavy workload over the next couple of weeks, please allow extra time for replies to correspondence and comments. Thank you so much! This entry was posted in Mediumwave, News, Nostalgia, Shortwave Radio, Software Defined Radio and tagged Patreon, Radio Preservation Task Force, Radio Spectrum Archive, SDR Spectrum Recordings, Shortwave Radio Audio Archive on October 31, 2017 by Thomas. Radio World supports efforts to save our radio and audio heritage, including the work of the Radio Preservation Task Force,?a project of the Library of Congress. Here is one in a series of guest commentaries about the topic. Jeremy Morris is an assistant professor in the Department of Communication Arts at the University of Wisconsin-Madison. In January 2014, Adam Curry sent a quick tweet out to his 40,000-plus followers with a modest request: “Looking for a full archive of ‘Daily Source Code’ mp3s.” Not just your average media user looking for bootlegged files, Adam Curry was one of podcasting’s first breakout stars in the early 2000s. He was trying to track down one of the first widely popular podcasts, the “Daily Source Code.” But his request was certainly odd; after all Curry was actually the host and producer of the “Daily Source Code,” which ran from 2004 to 2013 (over 860 episodes!). Click here to read the full article at Radio World. Thank you–as Richard knows, podcasting is the distribution method behind our Shortwave Radio Audio Archive. It’s an ideal platform for delivery of recorded broadcasts–listeners subscribe and then maintain their own local copy of the entire archive. Podcasting applications can insure that any new episodes are downloaded automatically. This year, I will represent the Shortwave Radio Audio Archive at the Radio Preservation Task Force meeting at the Library of Congress. I very much look forward to the event and meeting others in the radio archives world. This entry was posted in News and tagged Podcasts, Radio Preservation Task Force, Radio World Magazine on September 24, 2017 by Thomas. One of the most important events of the 20th century was World War II. The Cold War that followed and many of the national borders that exist to this day were largely created during that deadly, years-long conflict from the late 1930s to 1945. An expert speaking at the Library of Congress at the first-ever Radio Preservation Task Force Conference described how one of the most important tools for understanding World War II is available to researchers only because of an “accident” at KIRO Radio more than 70 years ago. During his keynote address last week in Washington, DC, longtime archivist and librarian Sam Brylawski spoke of KIRO Radio’s role in saving a priceless audio record of American history. It was a case of “accidental preservation,” Brylawski told the audience of more than 200 radio history scholars from around the US and Canada, that resulted in the creation of a nearly complete archive of CBS news broadcasts during World War II. “KIRO is the station in Seattle that cut lacquer discs to timeshift,” Byrlawski said, explaining how the scheduling of live broadcasts of CBS Radio’s news coverage was aimed at the Eastern time zone, which was not convenient for West Coast audiences. KIRO, as Brylawski described, violated network radio policies to make recordings of news programs on giant, 16-inch diameter discs, and then play them back a few hours later at times that were more convenient to Seattle-area listeners. This entry was posted in AM, News, Nostalgia, Radio History and tagged Archives, KIRO, Radio Archiving, Radio Preservation Task Force, WWII Archives on March 20, 2016 by Thomas. Last week, the Radio Preservation Task Force held a conference which focused on saving America’s radio heritage. I had hoped to attend in DC, but sadly had a conflict in my schedule that weekend. I’m happy to see that the conference got several mentions in the press. The launch of the first “Save America’s Radio Heritage” conference saw a greater turnout than expected, with a total of roughly 300 attendees over two days in the nation’s capital last week. The event, held at the Library of Congress and the University of Maryland, focused on the state of radio preservation, but the conference was more than just about the process of preserving historical recordings and other radio documents, but sharing some of America’s unique uses of the medium. A group of librarians, academics, and audio enthusiasts is gathering in Washington Friday for a first-of-its kind conference. The topic: “Saving America’s Radio Heritage.” The meeting is part of a massive effort to preserve recordings going back to the early 20th century. The effort is not focused on the classic network quiz shows and radio plays of the 1930s through 50s, said Chris Sterling, who chairs the Radio Preservation Task Force at the Library of Congress. One example is a 1956 interview with Rosa Parks from the Pacifica Radio Archives, recorded after Parks’ arrest for refusing to give up her seat to a white man on an Alabama bus. […]But there’s a problem: Radio, by its very nature, is ephemeral. That makes its history a little hard to document. Continue reading and listen to the full audio report on the CBS Radio Network. I hope the RPTF hosts another conference next year as I would like input on archiving AM/MW spectrum recordings–something I suspect few in the field even know exists! Any SWLing Post readers attend the conference? This entry was posted in AM, News, Nostalgia and tagged Archives, Radio Preservation Task Force on March 2, 2016 by Thomas.